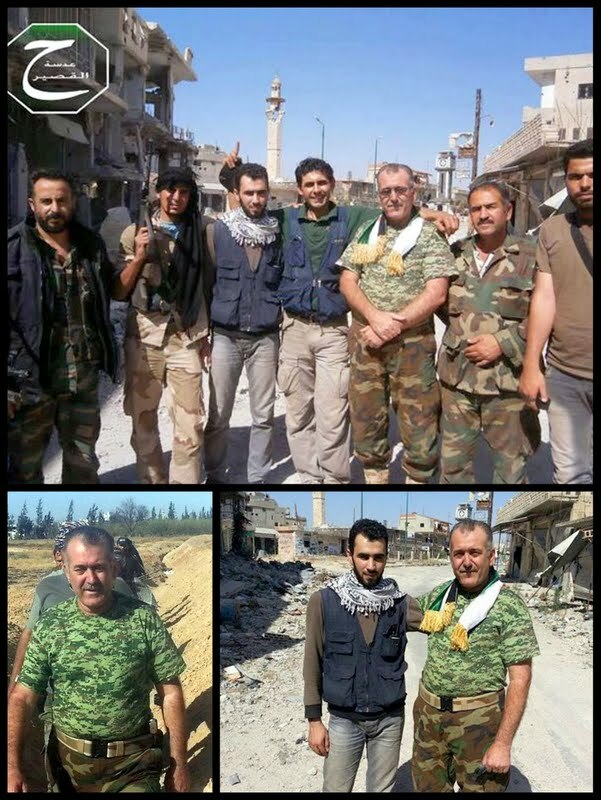 Col. Abdul-Jabbar Aqidi, member of the Free Syrian Army (FSA) Military Council headed by Gen. Salim Idriss, showed up on the frontlines and bombed streets of Qusayr yesterday, saying: “If there’s a will there’s a way” to come into the embattled town. Aqidi, who is former chief of the Military Council of Aleppo, will presumably assume overall command of opposition forces defending Qusayr, which is under a bloody siege by Syrian troops and Hezbollah guerrillas. Standing in the devastated town square, he told Hadi el-Abdullah, recognized spokesperson for Qusayr via Skype, he would be staying in the town to defend it. Aqidi later visited some of the injured in makeshift facilities and talked to a skeleton of medical staff tending to hundreds of people wounded in the onslaught by government forces. 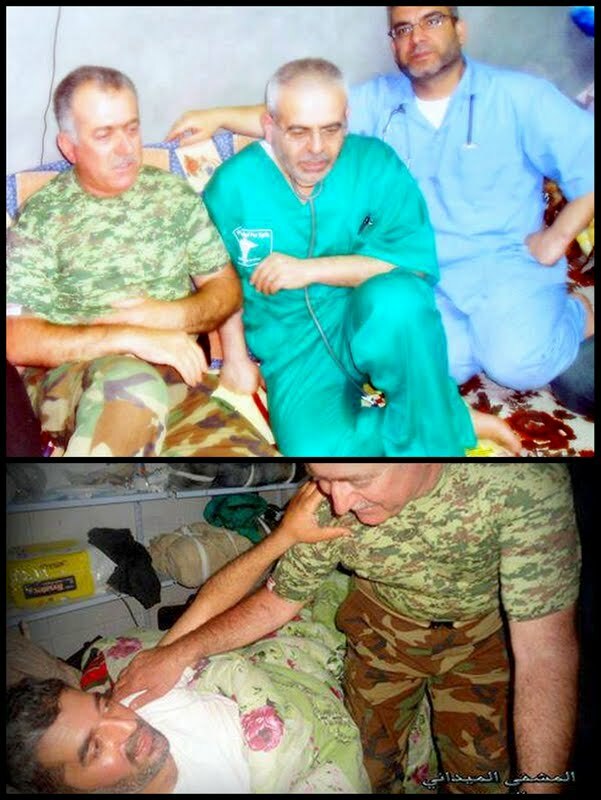 Dr. Fayez Matar is one of the wounded and the remaining medical staff includes Dr. Saleh and Dr. Qassem. Activists counted 12 airstrikes and two surface-to-surface missiles against Qusayr today. Russia yesterday blocked a UN Security Council declaration of alarm over the blockade of Qusayr, Security Council diplomats told Reuters. Britain, president of the 15-nation council, had circulated a draft statement to fellow members voicing "grave concern about the situation in Qusayr, Syria, and in particular the impact on civilians of the ongoing fighting." Qusayr, near the Syrian-Lebanese border, is usually home to an estimated 30,000 people. Fighting for control of the town has raged for two weeks. Council statements must be agreed unanimously. Russia blocked the draft text, saying it was "not advisable to speak out as the UN Security Council didn't when Qusayr was taken by the opposition," a council diplomat told Reuters on condition of anonymity. Another diplomat confirmed the remarks. Moscow's move to block the statement highlights the deep chasm between Russia and Western nations on how to deal with the Syria war. Russian diplomats in New York did not respond immediately to a request for comment. The draft statement, obtained by Reuters, also urged forces loyal to President Bashar al-Assad and rebels trying to oust him "to do their utmost to avoid civilian casualties and for the Syrian Government to exercise its responsibility to protect civilians." It appealed to Assad's government "to allow immediate, full and unimpeded access to impartial humanitarian actors, including UN agencies, to reach civilians trapped in Qusayr." Diplomats said Russia told council members the best way to deal with Syria was through intensive diplomacy. However, one council diplomat noted that Russia continues to sell weapons to Assad's government. Moscow and Washington are trying to organize a peace conference in Geneva this month that would involve the government and rebels. There has been wrangling over who should participate in the conference and no date has been set for it. French Foreign Minister Laurent Fabius suggested today that the conference could take place in July. He said the Syrian government and the opposition must attend what he called "the last chance" for a negotiated solution. "It's not just about getting round the table and then asking what are we going to talk about. It needs to be prepared. That is why I say that the July date would be suitable," Fabius said. Both the UN and the Red Cross have issued near simultaneous appeals for immediate access to be granted to Qusayr, where conditions are reported to be desperate. UN Secretary-General Ban Ki-moon, UN humanitarian chief Valerie Amos and UN human rights head Navi Pillay have all called for the protection of civilians and urged that thousands of trapped residents be allowed to flee the city. Ban reminded the Damascus government of its responsibility to protect civilians who come under its control, including from the threat of militias. He also called on the warring parties to allow trapped civilians to flee. In a separate statement later in Saturday, Ms. Amos and Ms. Pillay said they were “extremely alarmed” by reports that there are as many as 1,500 wounded people in the city in urgent need of immediate evacuation for emergency medical treatment. “The general situation in Qusayr is desperate,” Ms. Amos and Ms. Pillay said based on information they are receiving. This includes “reports that civilian neighborhoods continue to be indiscriminately attacked, and that other major violations of human rights and international humanitarian law are being committed,” according to the statement. Activists say escape routes for civilians have become unsafe. 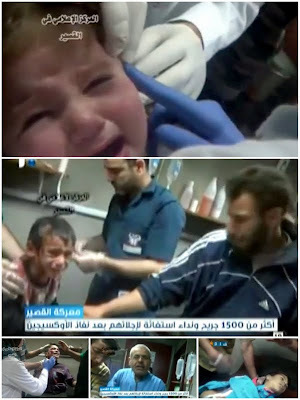 They reported this week that Syrian forces attacked a convoy of civilians seeking to flee Qusayr. 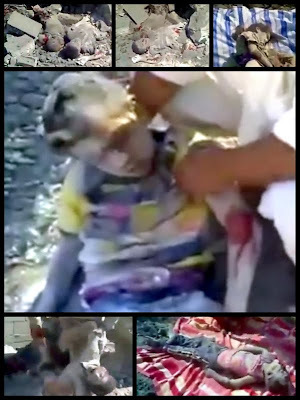 In Geneva, the Red Cross expressed alarm over the situation in Qusayr, and appealed for immediate access to deliver aid. "Civilians and the wounded are at risk of paying an even heavier price as the fighting continues," said the head of ICRC operations in the region, Robert Mardini. The BBC's Imogen Foulkes in Geneva says the fact both the UN and ICRC have issued urgent statements at the same time is an indication of how desperate they believe the situation has become.